I’m 31 yrs old and have been playing games for just about as long as I’ve been alive. Video games are as much a part of me as anything else I can think of. The memories I’ve had playing them just as deeply etched in my mind as the ones that I’ve had with family or friends. I can just as easily think back and see a level in Crash Bandicoot as I can recall a vacation I went on with friends or a Thanksgiving with family. 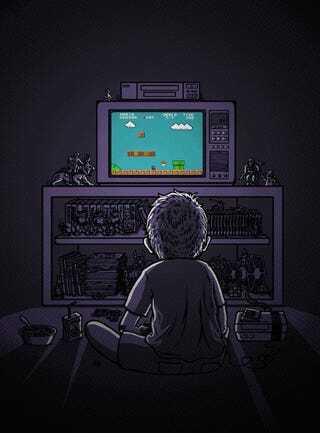 Anyone that has truly loved gaming has a million experiences that they’ve had in life, but just as with any memory, each gamer has a few special memories that they especially cherish. For me, there are a handful of games that give me a nostalgic feeling that I truly love. I’ll start with my all-time favorite game, MGS1 for the PSX. Hideo Kojima’s 1998 Stealth classic broke a lot of ground with its cinematic storytelling, wonderful voice acting and fourth wall breaking shenanigans. you to the next objective. Now 11 yr old me would’ve done just fine if it wasn’t for one thing......a surveillance camera. Somehow I’d have to get past the camera, avoid the guard moving past, and rush down the steps to the nearby elevator. Now, 31 yr old me is always packing some Chaff grenades to disable cameras, and if need be there’s always more than one way to get past it. But to say my younger self had trouble is an understatement. I had managed to blow through any useful items I’d had earlier in the Heliport and now was walking up to the camera near the stairs. I watched its pattern for an eternity. I’d like to think that of all the genres in gaming, the one I enjoy the most is RPG’s. I love being sucked into these strange new worlds, filled with interesting characters, and great fantasy and sci-fi elements. Many games have the ability to draw a player into those worlds, but whereas the average game can last around 6-10 hrs, the typical RPG can last 10 times that. I spent an insane amount of time playing RPGs on the PSX, SNES, Game Boy, etc. The handfuls that have really made an impact on me though are the Final Fantasy series and my favorite, the Suikoden series. In Suikoden, you play as the son of a renowned general who gets caught up in a war against the very empire that he was apart of his whole life. In the game, you become leader of the revolution and have to amass a large army to even the odds. This entails recruiting over a hundred characters to your side. During my first playthrough of the first Suikoden game, I really developed a strong bond with some of the more important characters you see early on in the story. So sufficed to say that when a character who will remain nameless dies later in the story, I freaked out. Finding out that it was because I, the player, didn’t do a good enough job and didn’t recruit every single person I could, was what led to his death was more than I could bear. I sat there on my floor, staring awfully close to the obscenely large Sears Television in my room. I paused for a moment and knew what I had to do...... I erased the evidence of my greatest failure, leaving behind over 100 hours of memories, and started all over again. This time though, I would search high and low to find everyone I possibly could. The funny thing is, like re-reading a book for the hundredth time, I would have no problem diving into that world and doing it all over again. There is something very special about online multiplayer. Being able to play a game with anyone from around the world at any time is an amazing feat. My buddies and I would play quite a few shooter games back in the late ‘00s. Whether it was COD, Halo, Battlefield, you name it. But the one we got the most enjoyment out of was probably Gears of War. Maybe it was the post-apocalyptic setting, the chainsaw gun, the larger than life char....no it was the chainsaw gun definitely. Damn, that was fun. So when Gears 3 was poised to hit shelves, we were naturally excited. When we saw that the entire campaign could be played in 4 player co-op, we knew what we had to do. It was an easy decision. Time to call out of work tomorrow, for tonight, we shall be there for the midnight release. We’ve all been on a line for something in our lives, but when the hot item in question has to do with gaming, its usually much more fun of a wait. Everyone on that line is a like-minded individual to you. For us, waiting in a long line outside of the local GameCrazy was far from a chore. We stood there, amongst our brethren, swapping stories of chainsaw duels and overpowered shotguns of battles past. Before we knew it, the game was ours and the plan was in motion. We would each get back to our respective homes, and link up to fight some locust scum. Now by itself, Gears of War 3 is not the most memorable game of all time, but the real draw is the 4 player campaign co-op. We played the entire thing, beginning to end throughout the night till the break of dawn. It was a gauntlet but at the same time, it was all so satisfying. When the battle was over, we all felt as though we really accomplished something as a team and our little group had been solidified. Oh, what joy wrestling games have given me over the years. My brother and I have probably bought every single smackdown game there ever was and will be, despite its brutal one step forward-two steps back design as the series progressed. Over the years we’ve put the series’ creation systems through its paces. Throughout multiple console life cycles, we have created our own federation, the BWA(Brothers Wrestling Alliance), Created PPVs(Triforce, Pinfall Wizard), and even made ourselves, as well as some twisted characters we concocted over time. I always cracked up at the thought of the nearly 7-foot tall Undertaker needing to be “sneaky”. I grew up loving the storylines my brother and I created, and how our characters evolved over the course of nearly 20 years. I’m telling you, you haven’t truly lived until you make a heel faction of zombie wrestlers(Regeneration X) fight a pimp demon and the guys from Flight of the Conchords, all the while arguing with your sibling over who won the “inter-brother title” more times. (side note-It was me. 5x champ baby). My brother now lives in Scotland while I’m still trying to make things work here in New York. We still talk about the BWA and how we need to make time to create a new PPV for whatever holiday that’s coming up. These moments are something I’ll take with me forever. Each gamer has their own stories. their own experiences. Two people from the same neighborhood, playing the same game at the same time can have two vastly different feelings about it. Different experiences. Perhaps one person finds an easter egg the other one didn’t. Maybe a player remembers finally beating a boss after hours of failing, whereas another had no problem at all. We can spend hours and hours talking endlessly about our experiences with these games. We take pride in experiencing things that others haven’t and find joy in sharing these moments with others. So what about you? What are some great gaming moments that you’ve had?